Former FBI director James Comey said during an interview with NBC News that he thought President Trump fired Comey to "shut down an investigation" that threatened Trump. Former FBI Director James Comey counts himself among the many people questioning why special counsel Robert Mueller did not make a determination on whether President Donald Trump obstructed justice. 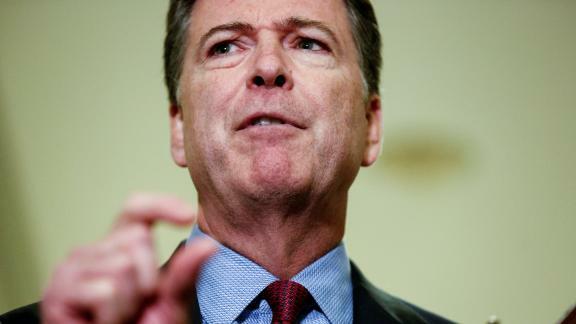 "I'm not prejudging it -- I'm just saying it doesn't make sense on its face, and so I have a lot of questions," Comey said in an interview that aired Wednesday on NBC's "Nightly News." He said he felt both Mueller and Attorney General William Barr "are entitled to the benefit of the doubt," but that he was surprised and confused by the choice. Mueller, Comey's predecessor as head of the FBI, was appointed to lead a special counsel investigation in the wake of Comey's firing, and a portion of the probe was dedicated to investigating if Trump had committed obstruction of justice. But Barr quoted Muller in a letter released on Sunday as saying that his report "does not conclude that the President committed a crime" and "it also does not exonerate him." Barr said he and Deputy Attorney General Rod Rosenstein determined Mueller's evidence was "not sufficient to establish" Trump had committed obstruction. Comey said the purpose of a special counsel was to separate "the politicals," like the Trump-appointed attorney general, from making "the ultimate call" on the President's actions. "So the idea that a special counsel wouldn't reach the question and hand it to the political leadership doesn't make sense," Comey said. In the interview, Comey said he did not know ahead of the report's conclusion how it would weigh in on the question of potential coordination with Russia, but was glad that Mueller was able to finish the investigation, reaffirm the US' conclusion that Russia interfered with the 2016 election and that "the evidence didn't establish that any Americans conspired as part of that effort." "That should be good news no matter what party you're associated with," Comey added. He also used the appearance to defend the FBI, saying the investigation's conclusion should show "the FBI is not corrupt, not a nest of vipers and spies, but an honest group of people trying to find out what is true." "The FBI did what it absolutely had to do," he said later in the interview. "The American people should be glad it's there and proud of it, and the rest is just lying and noise."